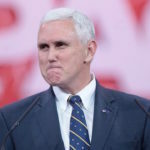 Mike Pence has a big problem, and we’re not just talking about the fact that he’s going down for obstruction of justice, or that he’s a deranged extremist loser who calls his wife “mother.” No, we’re talking about Pence’s more immediate problem: he has to play babysitter for an increasingly unraveling and incoherent Donald Trump – and it’s going particularly poorly for Pence. By now you’ve probably heard that Donald Trump met with Speaker Nancy Pelosi and Chuck Schumer today, and after he didn’t get his way, he slammed his fist on the table and yelled “bye bye” and stormed out of the meeting. This story is confirmed by Schumer’s own public statements, by unnamed staffers who were in the room and have repeated it all to the media, and by Trump’s own subsequent “bye bye” tweet. But now the official GOP position is that it somehow didn’t happen. Mike Pence was also in the meeting, and here’s what he told reporters about Donald Trump’s aggressive tantrum: “The president walked into the room and passed out candy. It’s true.” For the record, if you say something and then have to add that it’s true, it means you’re lying. Also, it’s possible for someone to hand out candy, then have a quasi-violent tantrum. Pence then added “I don’t recall him ever raising his voice or slamming his hand.” Also for the record, “I don’t recall” is what you say when you doin’t want to admit something. Kevin McCarthy the GOP House Minority Leader whom Donald Trump thinks is named Steve, offered a less polished version of his party’s official lie: “He never raised his voice.” McCarthy’s trouble is that he’s too stupid to even know how to use phrases like “I don’t recall” while lying. But it’s Mike Pence who should have known better than to have entered the fray at all, or to have even attended the meeting. He’s lying in defense of a deranged traitor, and we all know he’s lying.